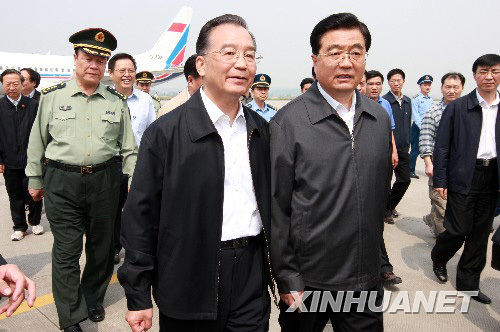 Chinese President Hu Jintao Friday went to Beichuan County of Mianyang City to visit people affected by the southwest China earthquake, encouraging them to be confident in overcoming hardships caused by the disaster. Hu first visited quake victims in Shengli Village, Leigu Town of Beichuan. More than 1,000 out of the 18,000 population in Leigu Town died or were missing in the quake. Hu went into a tent to talk to one family. Seeing the man's daughter was injured in the quake, Hu said, "We know you've suffered. The quake destroyed your house and injured members of your family. We feel your anguish. "The whole Party, army and all the people have been mobilized to support the quake relief work," he said. Hu went out the tent and said to people standing along the road, "We will make every effort to rescue stranded people, treat the injured and make proper arrangements for the victims, as well as helping you to rebuild your homes." He encouraged the victims to be strong, overcome difficulty with confidence, courage and strength. He then went to the Beichuan Middle School, where all the teaching buildings collapsed in the quake. Knowing there were still 300 teachers and students buried in the ruins, Hu said, "Saving lives is still an urgent task. We should rescue them by every possible means as long as there is a glimmer of hope." Hu also praised the troops conducting rescue work in Beichuan Middle School. "You came to the frontline immediately, and threw yourself into the rescue work regardless of your own safety and made a great contribution. "You have given hope, confidence and strength to the quake-affected people," he said. Hu said the rescue work has entered a crucial stage. "You should be unafraid of fatigue and work around the clock, making great efforts to keep losses to a minimum." In a field clinic in the middle school, he kissed the face of Luo Mengxi, a three-and-half year old girl who lost her mother in the quake. He went back to Beichuan county seat and visited the Nanhe Sports Center, where more than 10,000 disaster-affected people were settled. He thanked the volunteers for their contribution to the rescue work. He also visited the Mianyang City Central Hospital, telling the medics to make every effort to treat the injured. Hu went to the quake-hit areas Friday to console quake-affected people and direct disaster relief operation. Hu arrived at Mianyang City at Friday noon after more than two hours of flight from Beijing. In the meeting room of the airport, he and Premier Wen Jiabao, who had been directing relief work in the disaster-hit areas since Monday, discussed the quake-relief work. The meeting said "rescuers must reach not only towns but also all villages." The survivors who had been rescued must be transferred to safer places in time, and children who lost their parents and elders who lost their family members in the quake must be properly cared for. Also Friday morning, Premier Wen Jiabao told Chinese media on a train in Sichuan that saving lives remained the top priority almost four days after the quake. "We won't give up if there is even the slightest hope of finding more survivors," he said. The death toll from the powerful earthquake rose to 22,069 nationwide as of 2 p.m. Friday, while 168,669 people were injured, according to the emergency response office of the State Council.